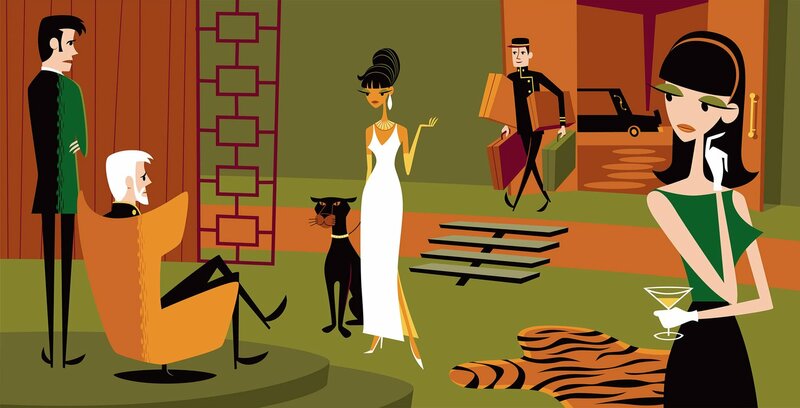 These are the limited edition prints released by Josh Agle during 2018. 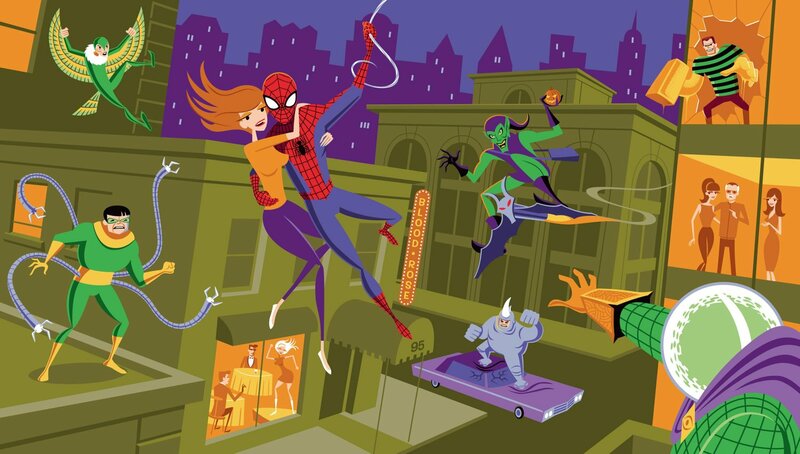 Spiderman carrying Mary Jane Watson surrounded by iconic villians – what’s not to love? 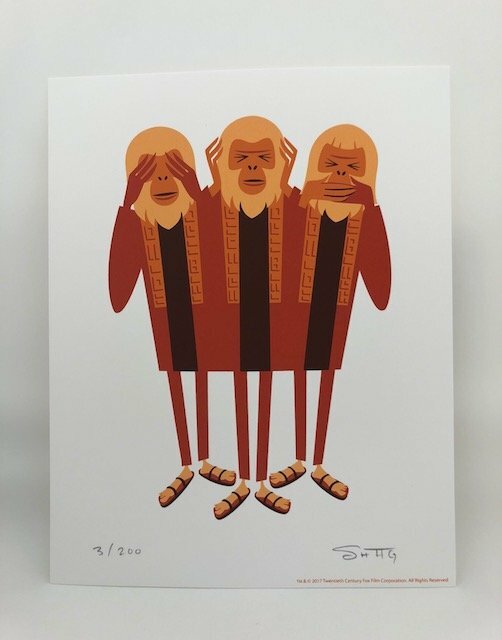 Spiderman creator Stan Lee collaborated with Shag and approved this print prior to his sad loss earlier this year – he also cameos. Released at the 3rd Anniversary of the Shag Store West Hollywood on Saturday 8th December. 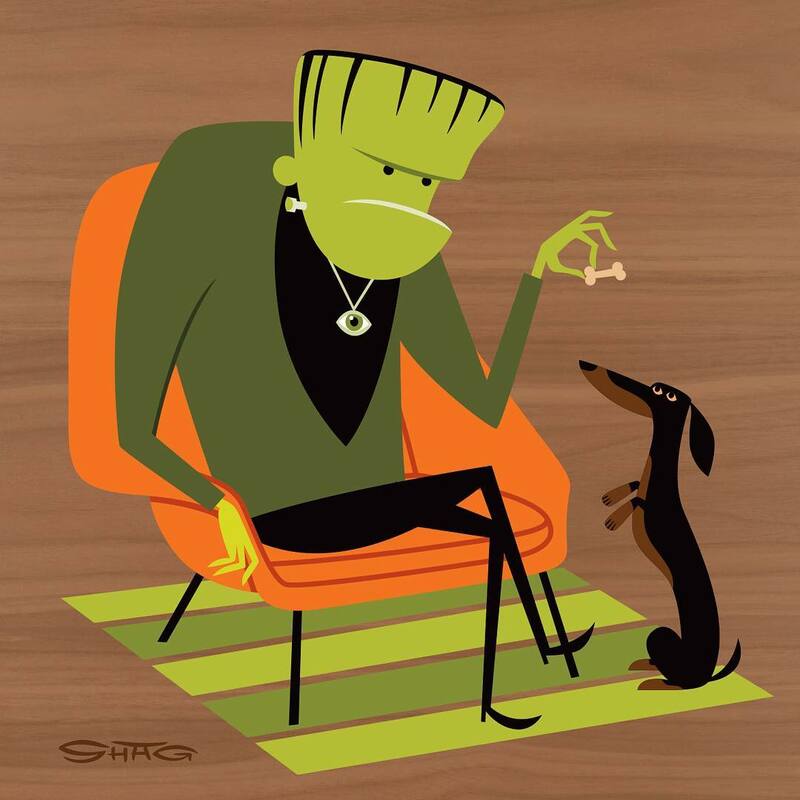 The four Mahogany Monsters limited edition mini-prints were released at DesignerCon 2018 from the 16-18 November. The images are printed on plywood and are named The Wayward Wolf, The Undead Count, The Greenish Monster, and The Dead Pharaoh. The signature on the front is printed, with a rear sticker showing the print name and edition number. The mini-prints are easy to hang with a built-in keyhole mounting for nails. 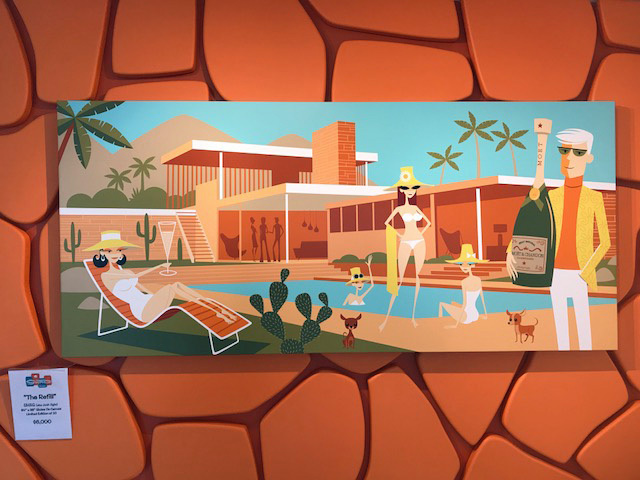 The picture is set at the Elrod House in Palm Springs, California, as designed by John Lautner. 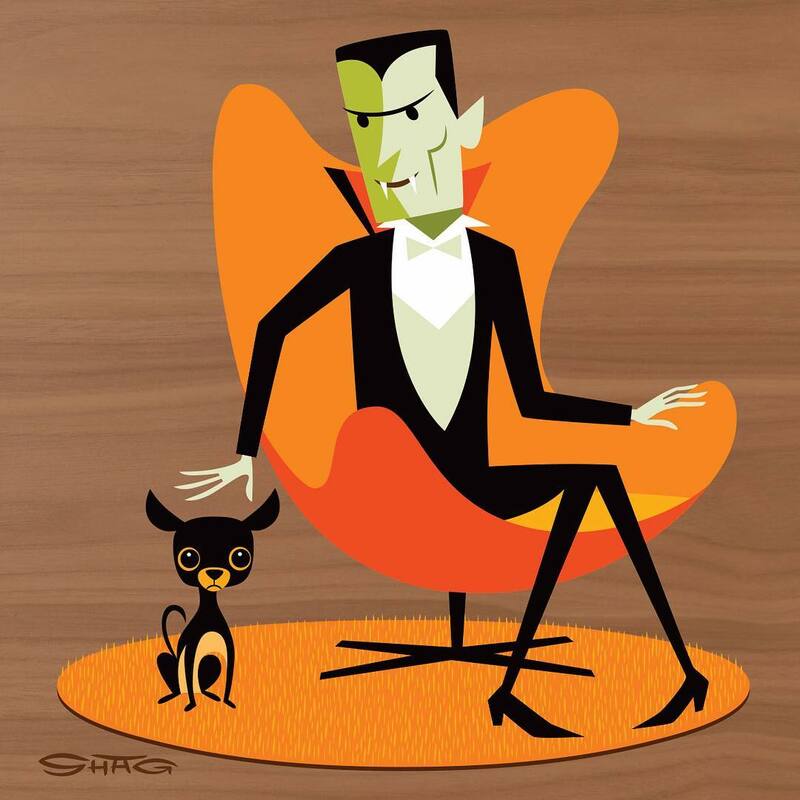 Released at the Fall Preview Print Release Party at the Shag Store in Palm Springs on Saturday 20th October. The Queen of Sheba Print Release Party was held at the Shag Store in West Hollywood on Saturday 6th October 2018. The Purrfect Crime Print Release & Cat Party was held at the Shag Store in Palm Springs on Saturday 8th September 2018. 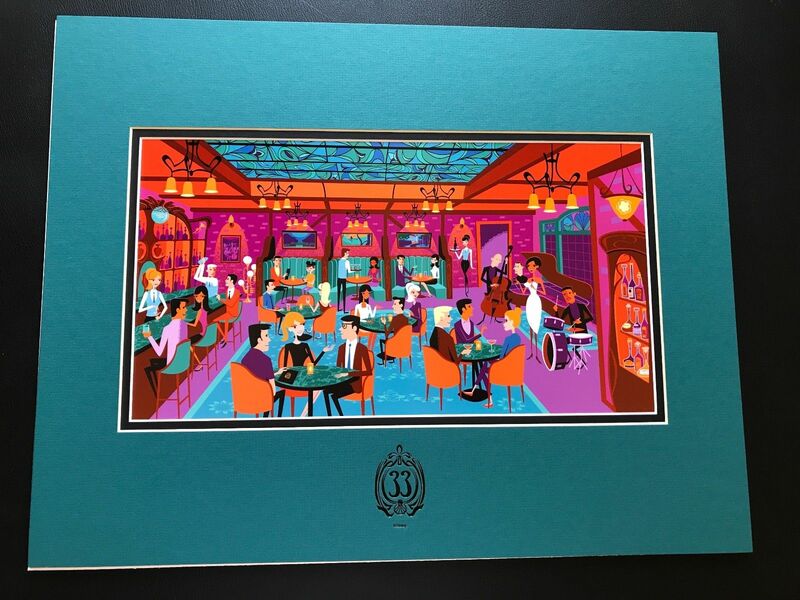 Released by Disney’s Club 33 at The Secret Salon Reception in the Club 33 salon at Disneyland on Thursday 30th August 2018. Not signed or numbered. Kaika Mahine is the fourth release in the Unthropology series depicting young women set in Polynesian Islands wearing traditional dress alongside traditional tiki carvings. 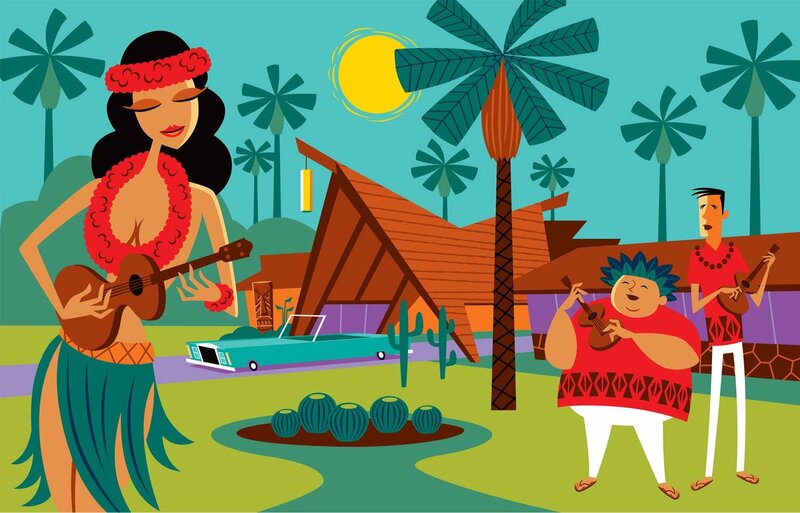 The series began with Wahine Ata Ahua at Tiki Caliente 2017, followed by Uha Rapa Nui at Tiki Oasis 2017 and then Aumauri Tapairu at Tiki Caliente 10. The print shows a kaikamahine (girl, daughter, niece etc.) in front of a Hawaiian Tiki representing Ku, god of war. 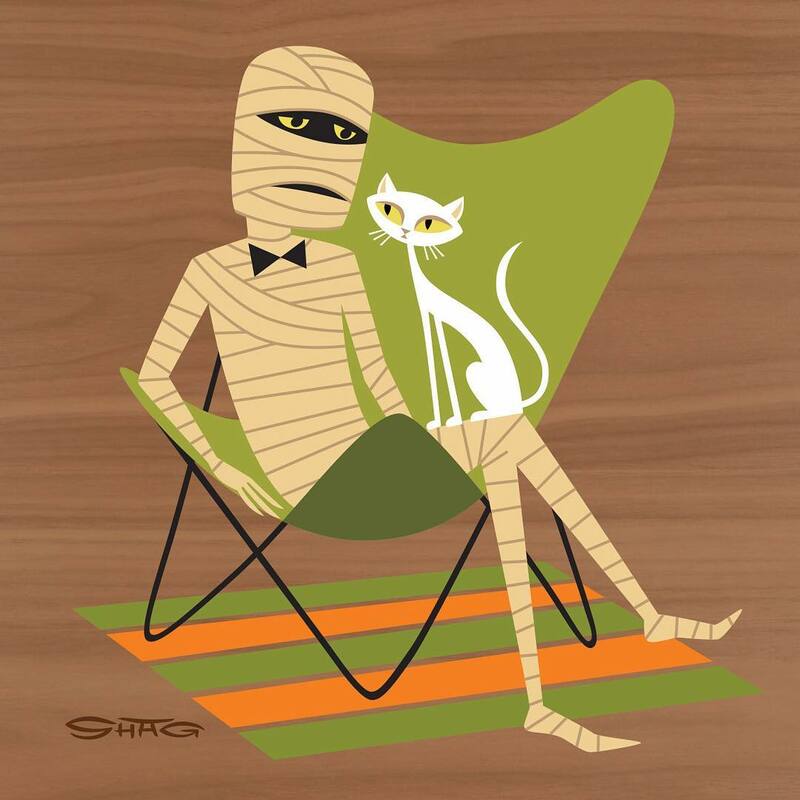 This print was released at Tiki Oasis 2018 in San Diego on Saturday 11th August as a signed and numbered limited edition of 100. 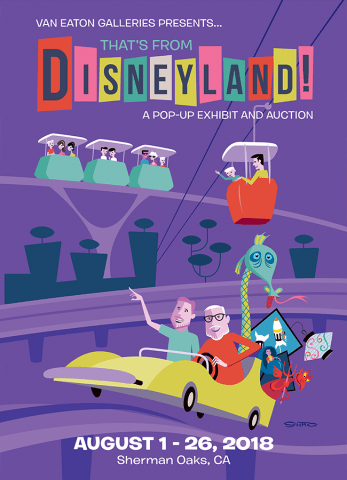 Limited edition print released on Sunday 5th August 2018 at the That’s from Disneyland! artist book signing event held by Van Eaton Galleries. 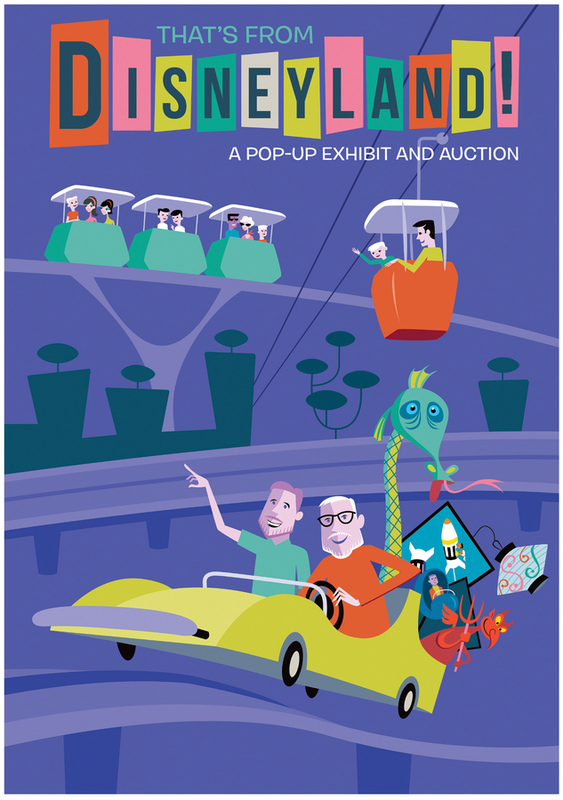 The giclée on paper print features Richard and Nicholas Kraft riding an Autopia vehicle as they collect pieces of Disney memorabilia (including the Submarine Voyage’s Sea Serpent). In the background are the Tomorrowland People Mover and Skyway rides. Note: A poster was also released with a purple background and more text. The hand-numbered and hand-signed limited edition print is available from Van Eaton Galleries. Part of a triptych celebrating the 50th anniversary of the Planet of the Apes film for Twentieth Century Fox. The triptych was released at San Diego Comic-Con on the 18th July. 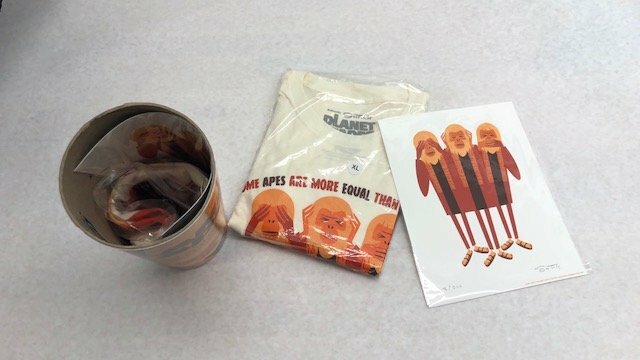 Planet of the Apes print and t-shirt to celebrate the 50th anniversary of the Planet of the Apes film for Twentieth Century Fox. 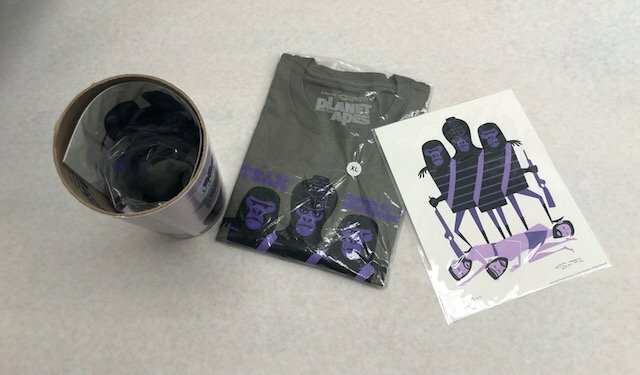 The t-shirt was supplied in a printed tube in sizes S/M/L/XL/XXL. 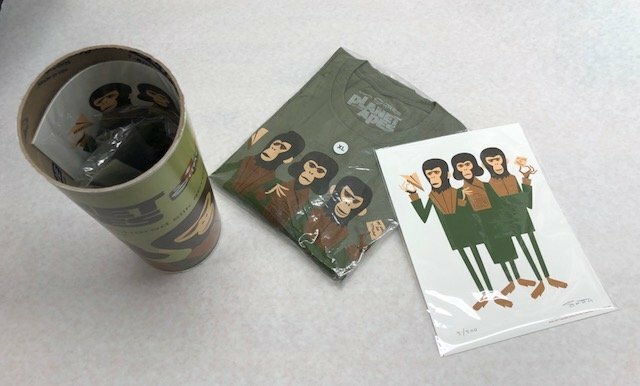 The print and t-shirt set was released at San Diego Comic-Con on the 18th July. The six Cocktail Birds mini-prints were released at SDCC2018 on the 18th July. 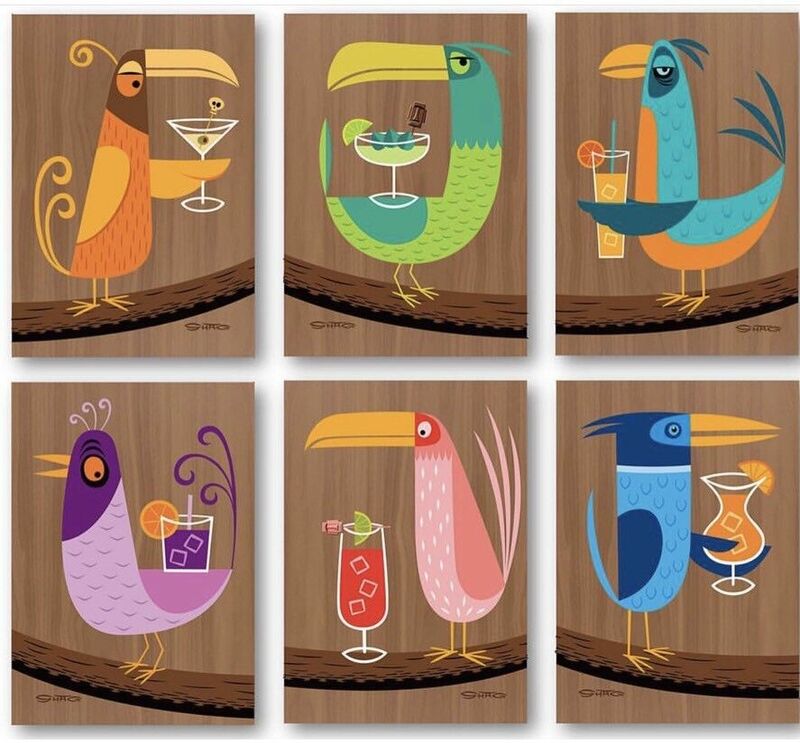 The images are printed on plywood and are named Martini Bird, Daiquiri Bird, Bellini Bird, Negroni Bird, Campari Bird, and Baccardi Bird. Note that the signature on the front is printed, with a rear sticker showing the print name and edition number. The mini-prints are easy to hang with a built-in keyhole mounting for nails. The Sunset Strip Shag Party & Print Release Event! was held at the Shag Store in West Hollywood on June 9th 2018. 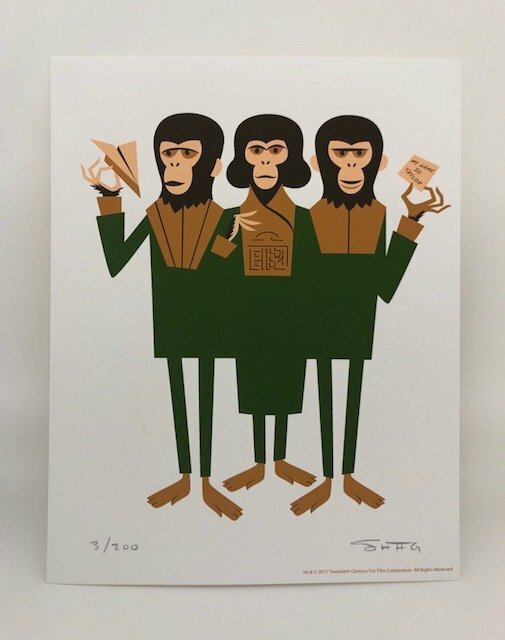 The 8th Anniversary Print & Print Release Party was held at the Shag Store in Palm Springs on Saturday 26th May 2018. This is the third and release in the Unthropology series depicting young women set in Polynesian Islands wearing traditional dress alongside traditional tiki carvings. The series began with Wahine Ata Ahua at Tiki Caliente 2017 and continued with Uha Rapa Nui at Tiki Oasis 2017. This picture is for the Cook Islands and shows aumauri, light silvery green fish up to three feet long, drying on the line. The tapairu, eldest daughter of a chief or beauty, can be seen sitting down. 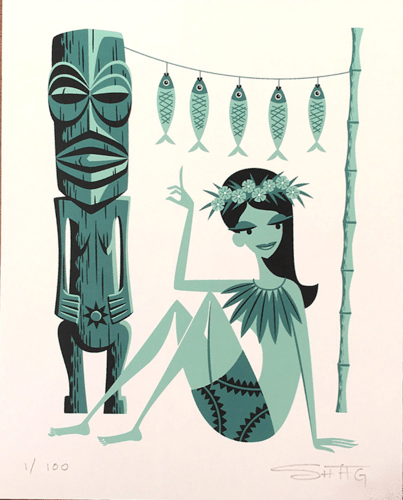 This print was released at Tiki Caliente 10 in Palm Springs on Saturday 19th May 2018 as a signed and numbered limited edition of 100. The original painting is from Modernism Week 2016 when a cropped image appeared on a wooden promotional card. 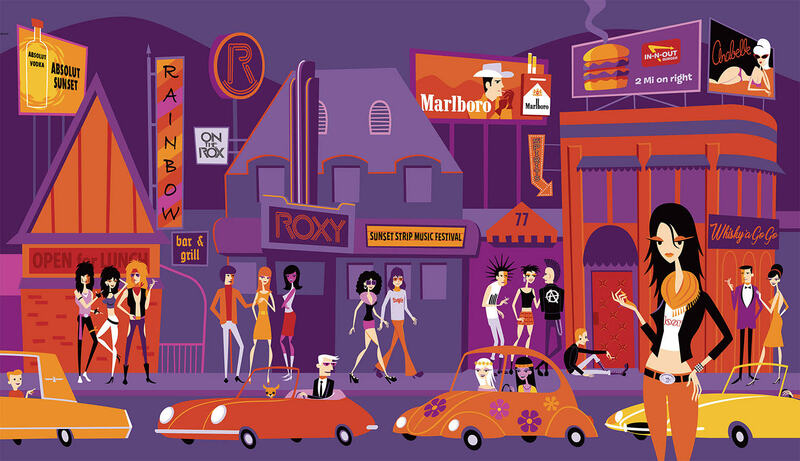 The launch party for this new print was at the Shag Store in West Hollywood on Saturday, April 7th. This is a limited edition of just ten giclée on stretched canvas prints, hand signed and numbered by Shag. 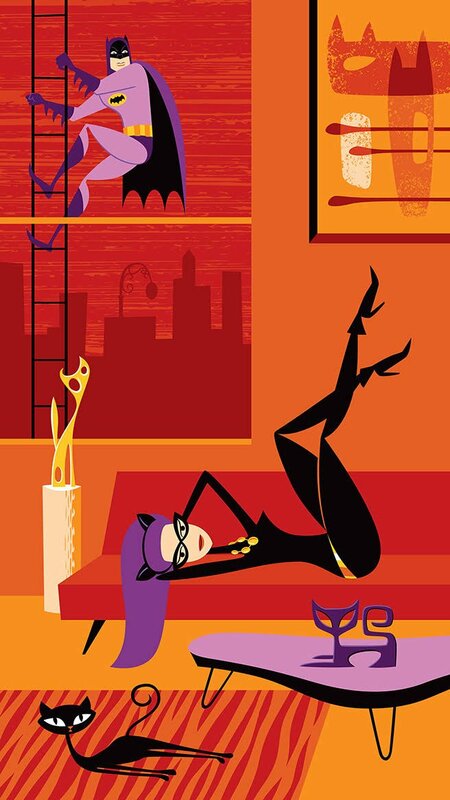 The 2011 serigraph print was produced during Modernism Week 2011 as a fundraiser for the Palm Springs Modern Committee. The picture shows the Kaufmann house, a mid-century modern Palm Springs landmark built in 1946 by architect Richard Neutra. Simon and Garfunkel perform in Gary and Joan Gand’s beautiful Palm Springs’ House. 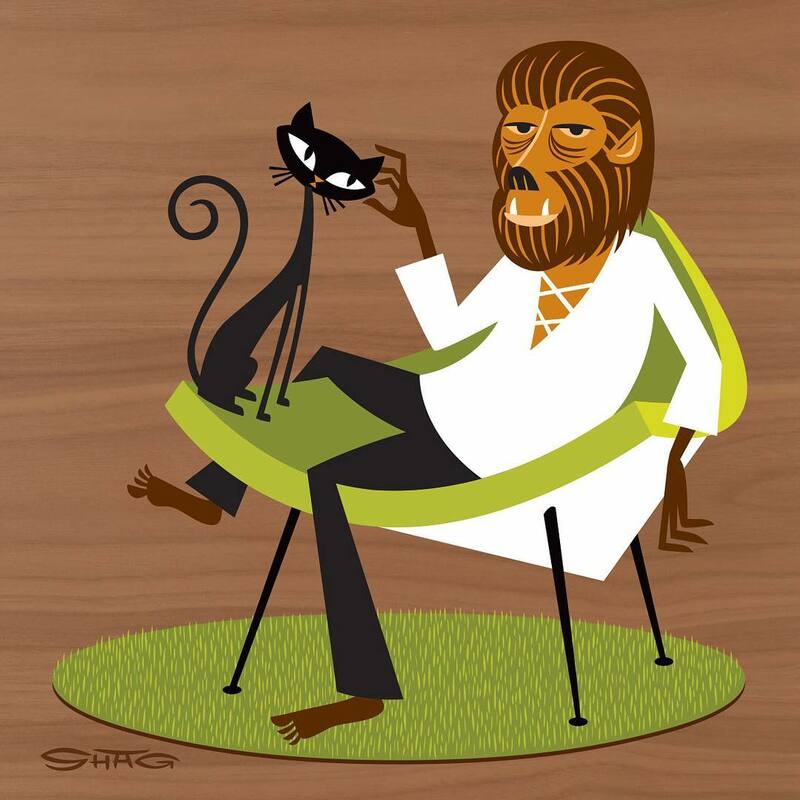 This is the first limited-edition print of 2018 and was released during Modernism Week 2018 on Saturday, February 17th at the Shag Store in Palm Springs, California. 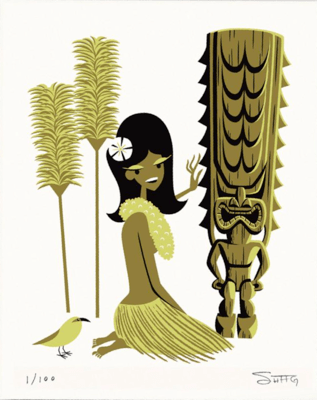 This print features the Royal Hawaiian Estates as designed by Donald Wexler. This print was released during Modernism Week 2018 on Saturday, February 24th at the Shag Store in Palm Springs, California.